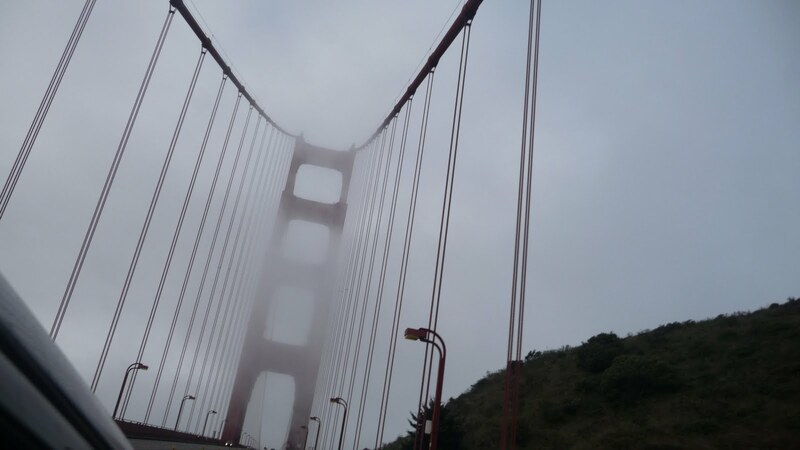 We took too many good pictures on our last day in San Francisco, so I have to write about it in two parts. 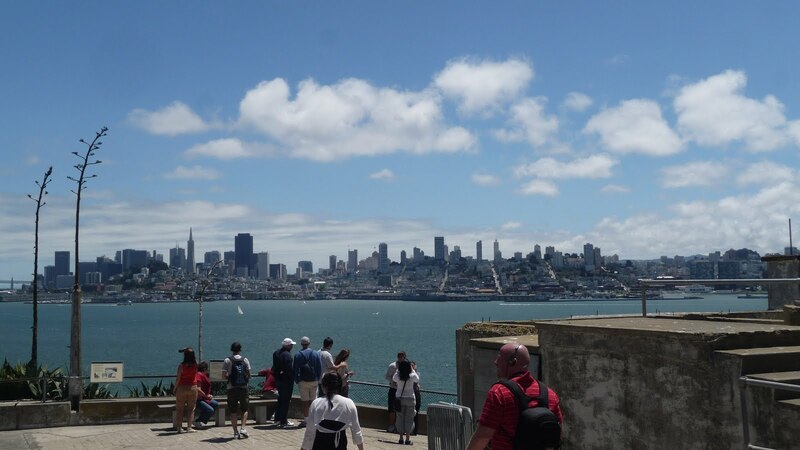 We had planned to go to Alcatraz on Sunday and had to drive into the city because the ferry left Marin after our boat to the island was scheduled to depart. We must have 400 pictures of this bridge. I need to learn how to make a collage of them (I don’t have photoshop) so you can see the madness. My husband’s friend who works at Alcatraz and who we had dinner with the previous night told us to get a bacon donut at this place in the Mission (I can’t remember the name of the donut shop), but we arrived too early. What donut shop opens at 9am on a Sunday? 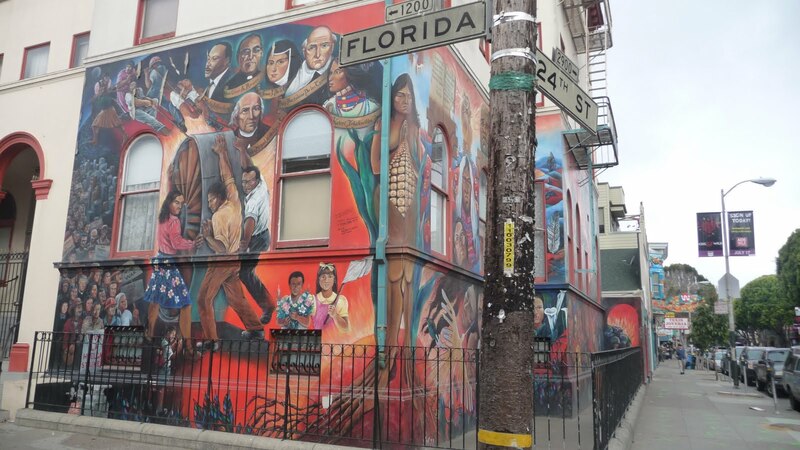 Oh well, at least we got to see a bit of the Mission district. 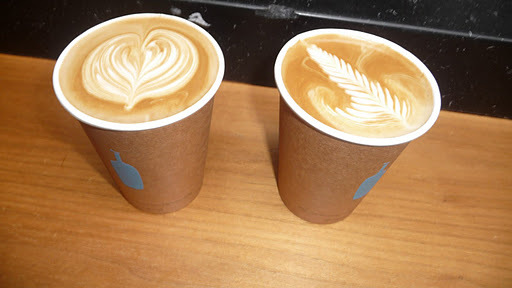 Since we still needed breakfast before we left for Alcatraz, we headed back to the good old ferry building for Blue Bottle Coffee and croissants from Acme Bread Company. 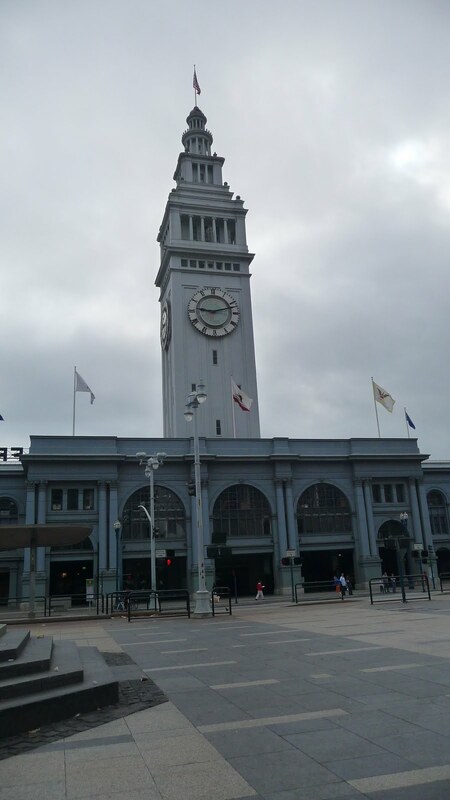 Here is the ferry building from the outside where we ate our breakfast. 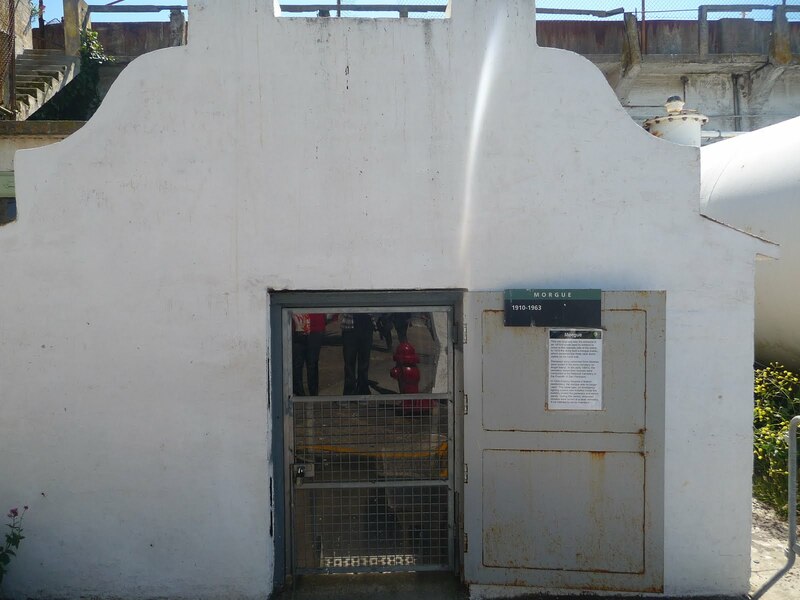 When we got to the Alcatraz tour dock, we realized our tickets were for a combination Angel Island/Alcatraz tour. 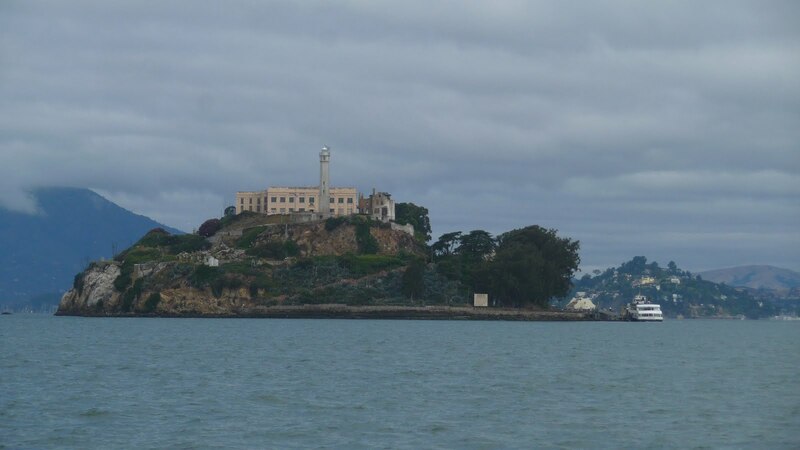 My husband had hoped that we would go to Alcatraz first and just ditch the Angel Island part, but nope. 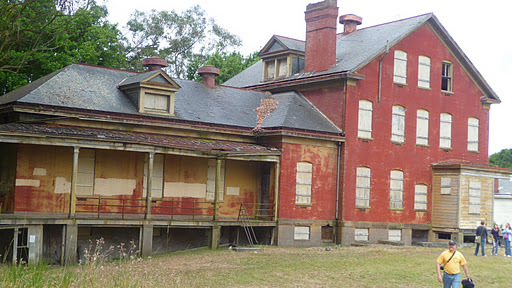 They take you to Angel Island first for two hours and then back to Alcatraz. We were really annoyed because we didn’t want this to take up our entire day, but it ended up being a blessing in disguise. 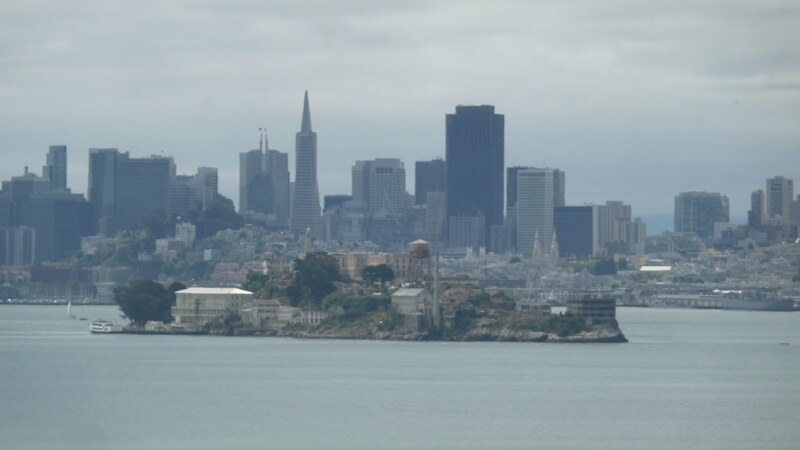 We waved to Alcatraz as we went right past it on our way to Angel Island. I’m kind of obsessed with sailboats. I want to go sailing without doing any of the work. We decided this is where we’d like to live. I looked up these houses on Zillow when we got home and realized we’d need to win the lottery before we could ever afford to live there. Some of those houses are worth 6 million! After the tram tour, we had an hour to get a bite to eat before our boat headed to Alcatraz. It was a beautiful day and we really enjoyed sitting outside with a view of the ocean. 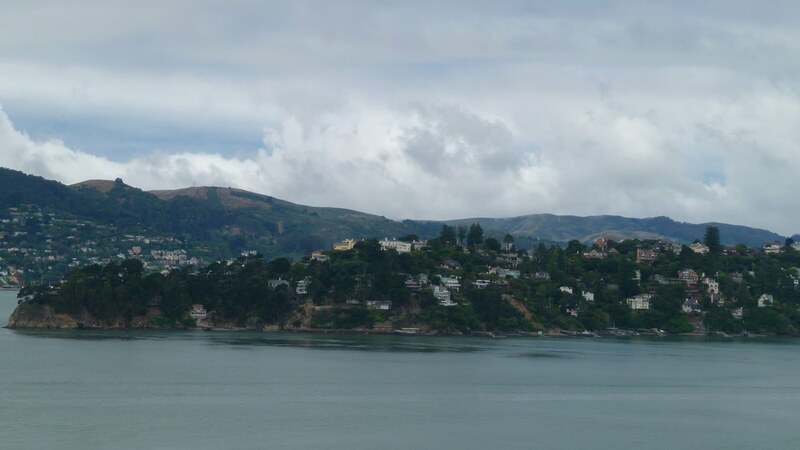 I highly recommend Angel Island. Take the tour and bring a picnic lunch and eat on the big grassy lawn in front of the immigration building. Perfection. 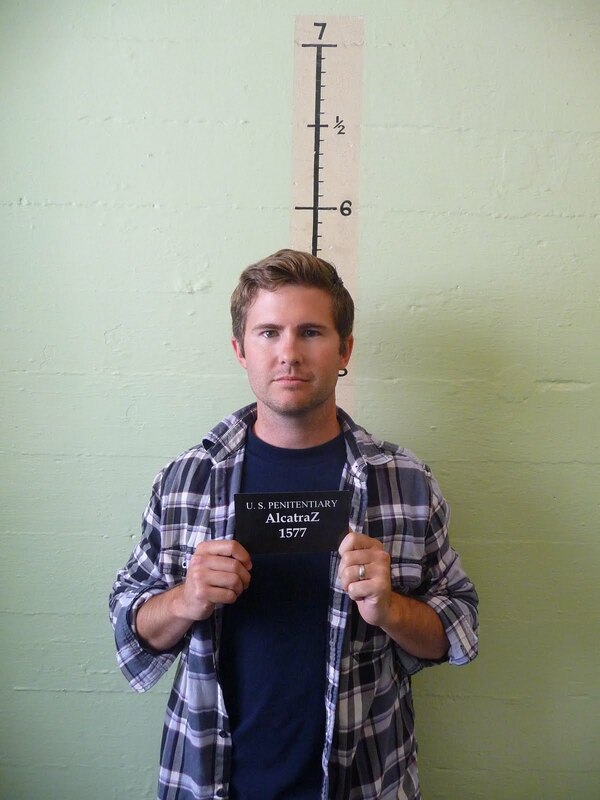 When we got to Alcatraz, my husband’s friend was ready to show us around. He walked us up to the cell house giving us some background information about the island and how it was originally used as a military prison. The most incredible part is that the island is surrounded by the most beautiful views you can imagine. 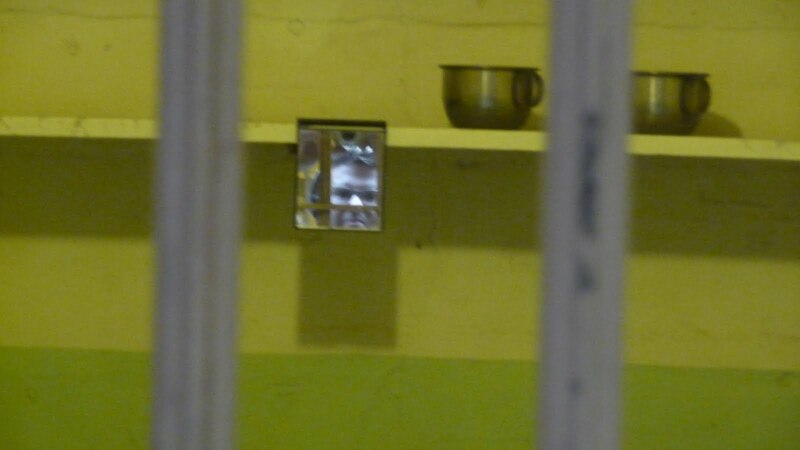 When the prisoners got a glimpse outside, they could see exactly what they were missing and it must have been tough, to say the least. 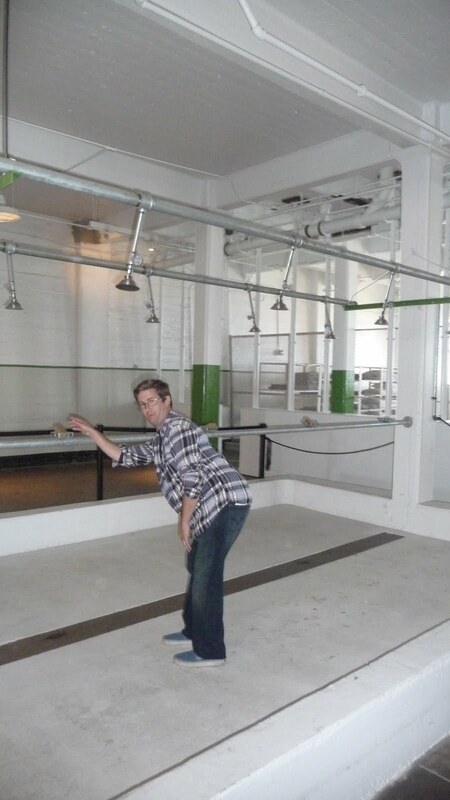 Since we were VIPs, my husband got to sneak behind the ropes to take a picture in the showers. We did the audio tour next, which was actually really cool. 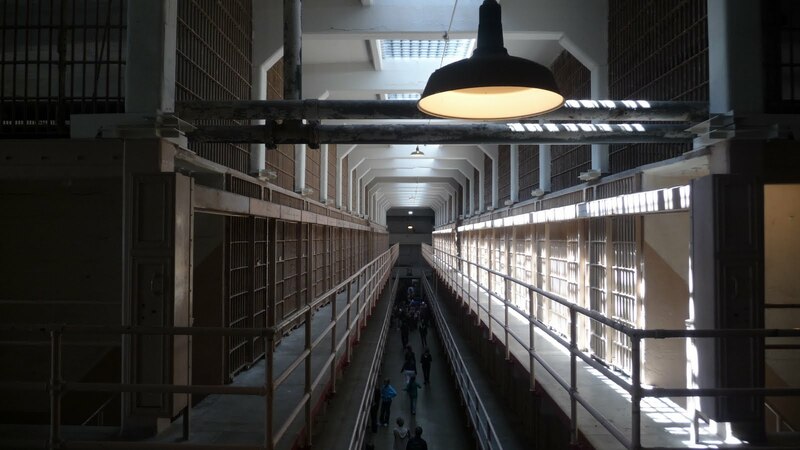 It features voices of former prisoners and guards of Alcatraz and takes you around the whole prison. It is free with the price of the tickets, so it is totally worth it. 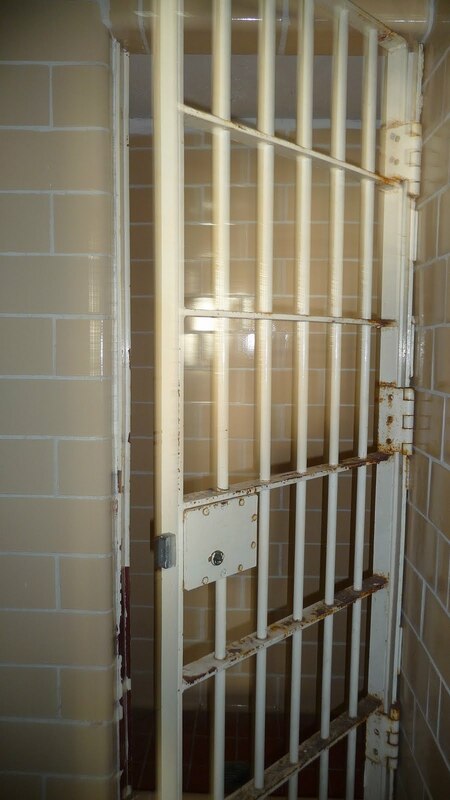 Here’s what one of the cells looks like furnished. This next one is funny. My husband was trying to get a picture of his reflection in the mirror, but he couldn’t really see so he was squinting. When he squints, he looks like he’s really pissed off. How tortuous is this view? After the audio tour, my husband’s friend continued our behind the scenes tour and took us up to the gun gallery. 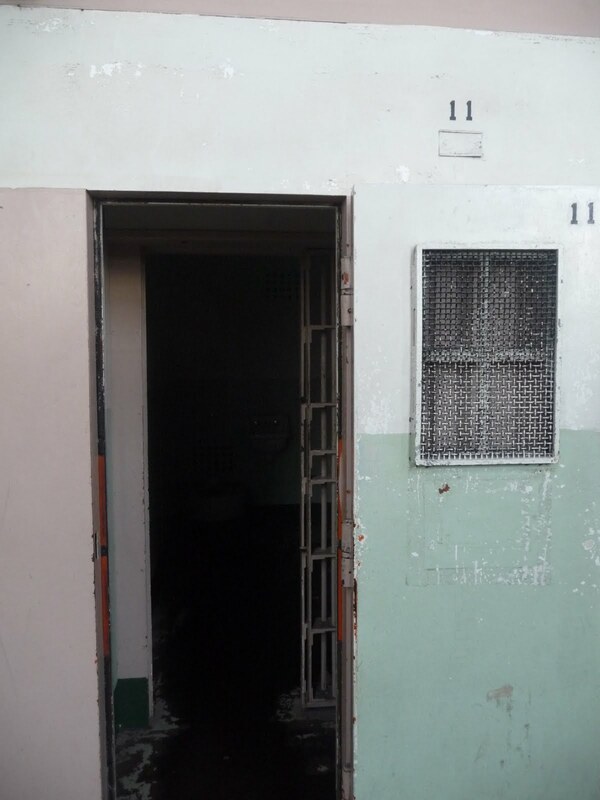 This is where the guards would pace back and forth in case any of the prisoners got crazy. My husband took this picture from one of the holes they would have used for their guns if they wanted to duck down and hide. 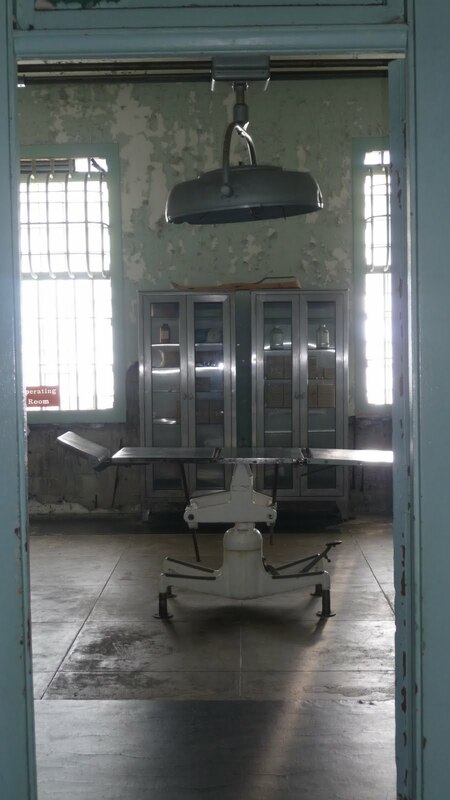 Then, we headed up to the creepiest part of the prison, the hospital ward. This reminds me of One Flew Over the Cuckoos Nest. There was lots of graffiti upstairs, one of the reasons it was closed to the public. Our guide told us that Inga from Sweden started it all. 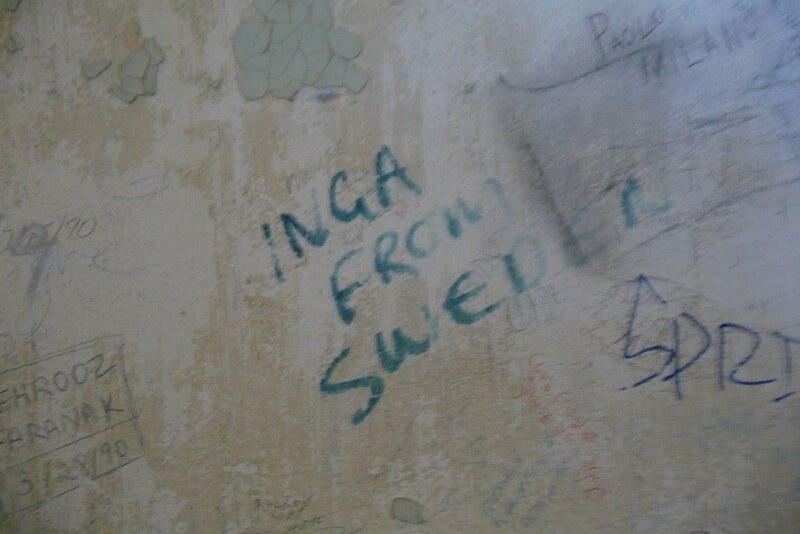 Thanks a lot, Inga. After we were sufficiently creeped out, we headed back downstairs and took some mug shots. 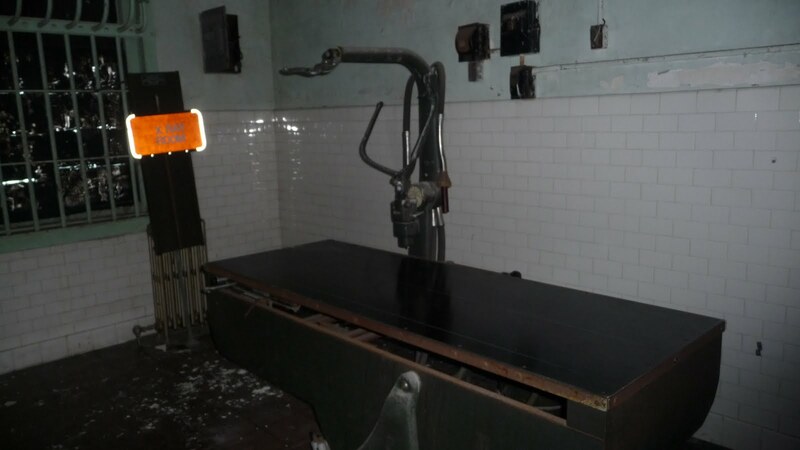 And on our way back to the boat, we saw the morgue. 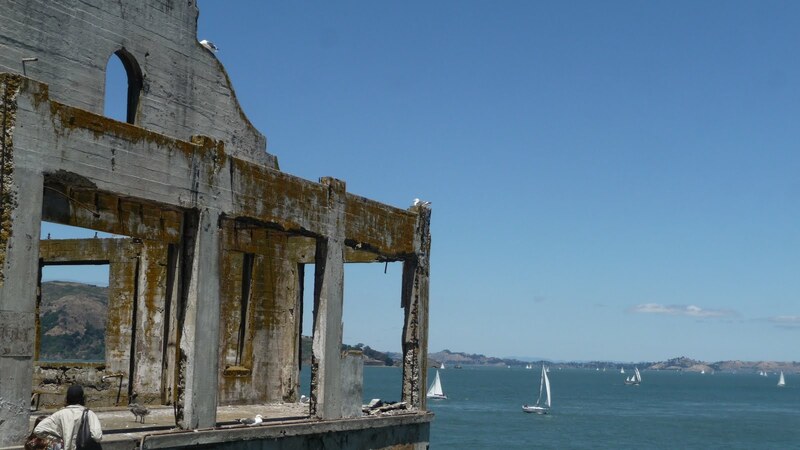 Many people think that Alcatraz is a tourist trap, but it really is an amazing experience. 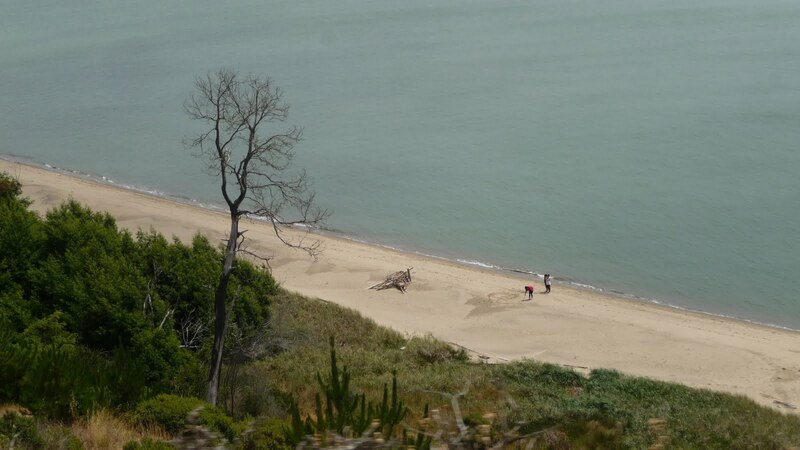 I highly recommend it to anyone visiting San Francisco. Ask one of the guides for a behind the scenes tour. They might just give it to you. 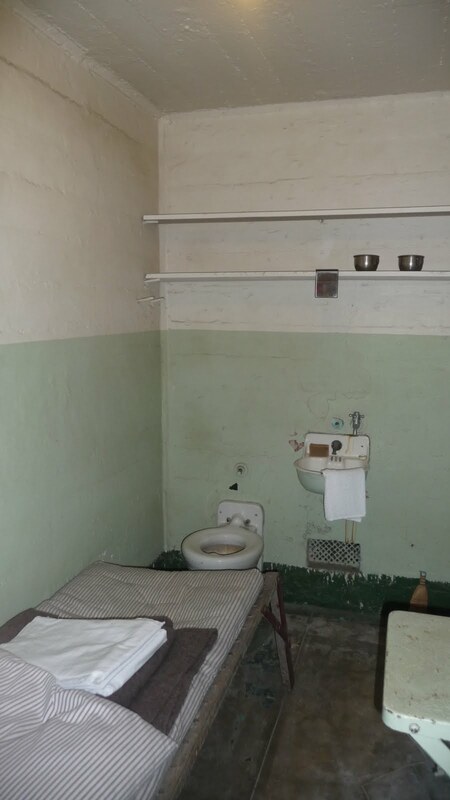 Have you been to Alcatraz? If yes, what was your favorite part? If no, would you ever consider going? For my last post: more food. You didn’t think we were done eating, did you? 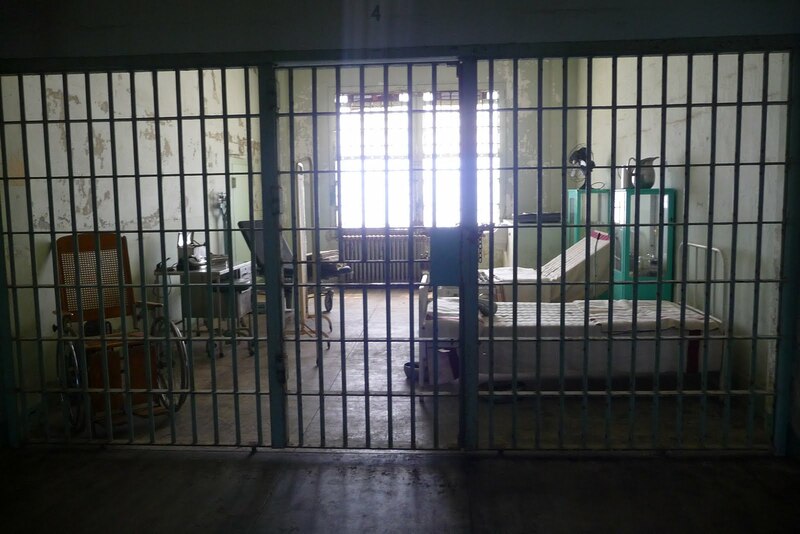 I'm so jealous – I was trying to buy tickets for Alcatraz this weekend and they've been sold out for a month! Looks like so much fun, will have to go next time! I've never been to Alcatraz! Two years of living in SF, and I never went! It's funny how once you become a resident somewhere you tend to skip the tourist attractions, but when you're visiting you want to go. In any event, I'll be back there in October for our annual convention. Hopefully I'll have time to go! I have 7 unread posts from you this week because I've been so slammed!!! But I'm finally sitting down and reliving your trip (backwards)…woo! 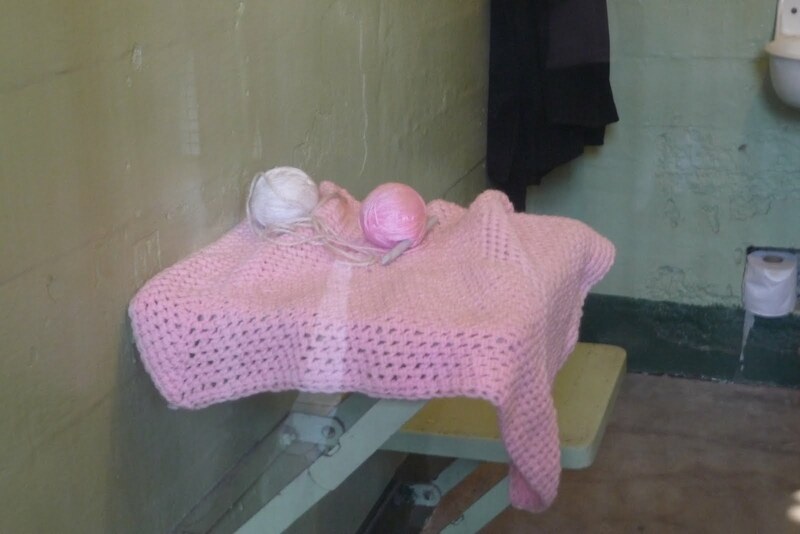 I love Alcatraz too, but WOW you definitely got the VIP tour…so many parts I never saw before, very cool. Indeed, it's a great tour (even the lowly normal people one!!! haha). Thank you for sharing the cool stuff that I've never seen, how fascinating! 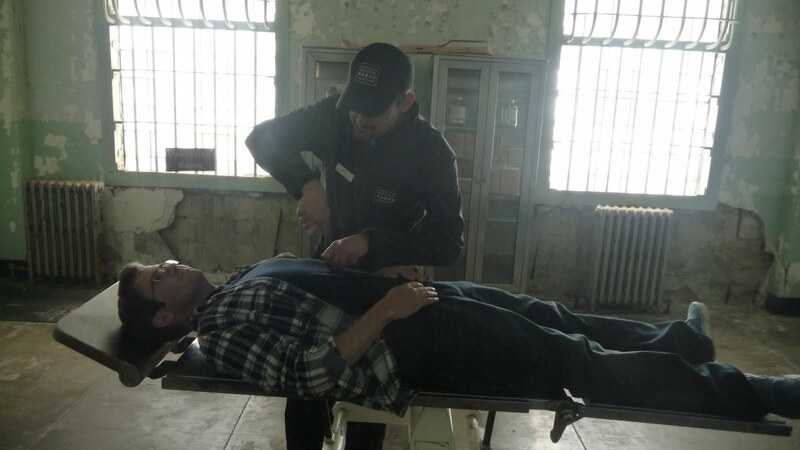 I'm loving all your SF recaps! 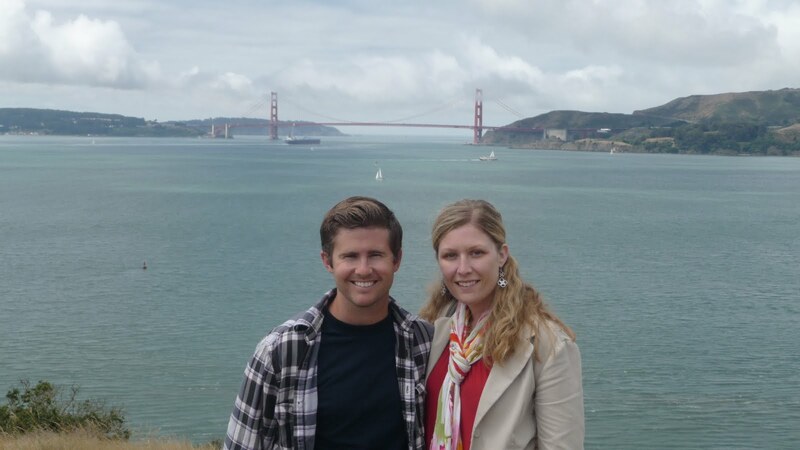 We went to San Francisco for our honeymoon and totally fell in love with the city. 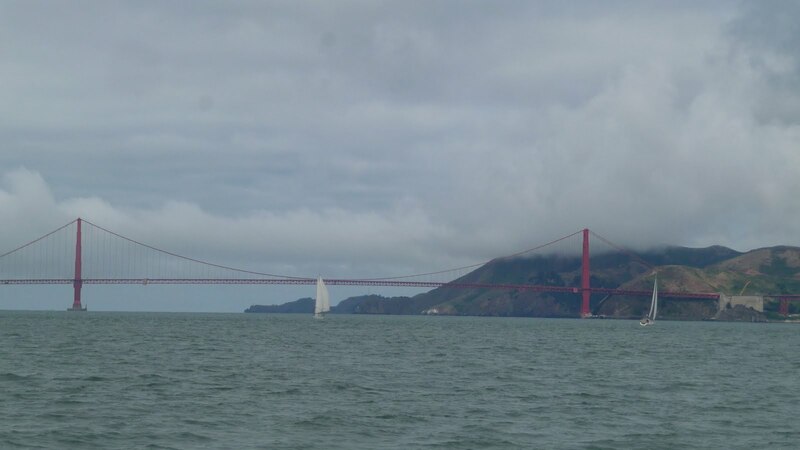 I would have LOVED to do the Alcatraz tour, but the hubs is not the biggest fan of boats so we decided to nix it. Maybe next time! Thanks for the comment over at my blog – much appreciated.And after reading all your vaca posts, I really want to learn to take better pictures. 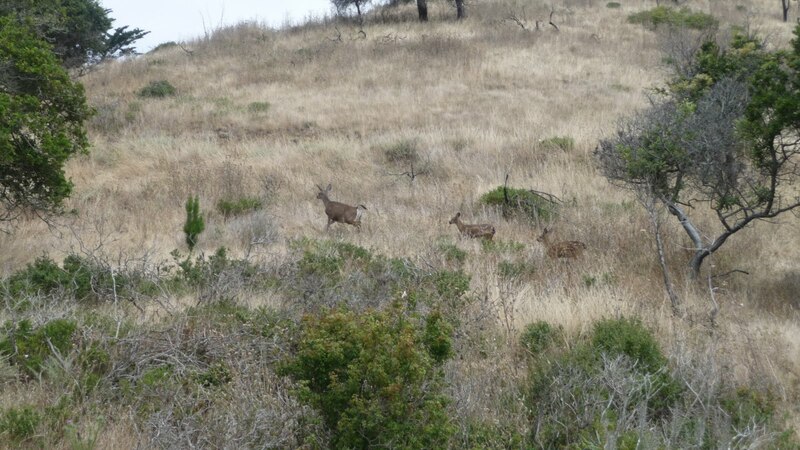 Oh, and to get my point-and-shoot lil' camera fixed so I have something to take them WITH. 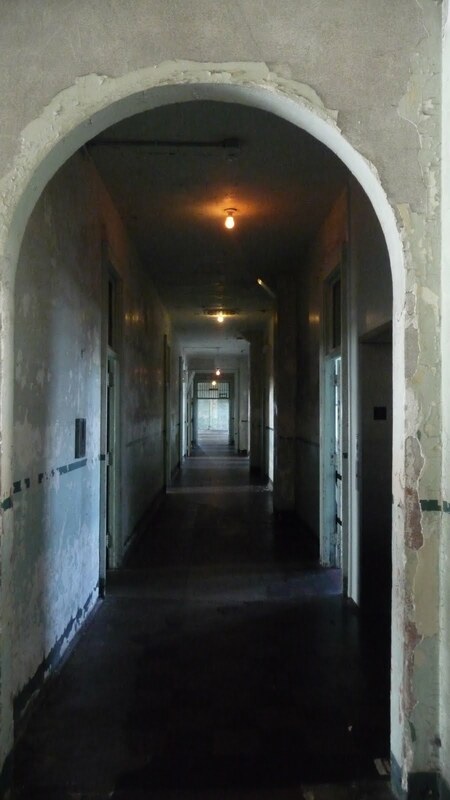 WOW Alcatraz is SO spooky, but SO intriguing! Those pictures are awesome. you are a fantastic photographer! 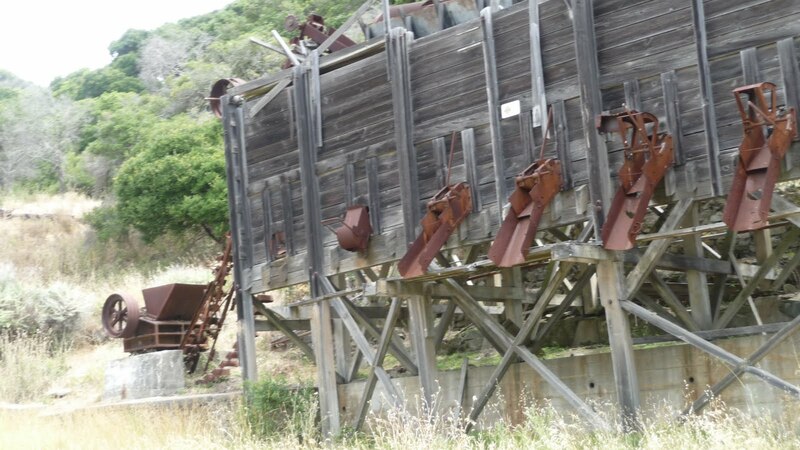 I haven't been there since I was little, and would like to go again.